Cricket in our country is nothing short of a religion, with Sachin Tendulkar as the God himself. This epitomizes the madness of cricket in India. Here we live again some of the greatest winning moments that every Indian has witnessed and have made them proud. Nobody gave India a chance against the fearsome West Indies pace attack but a rookie Sunil Gavaskar led the Indian charge and ultimately to a famous series win. India came in as the underdog with West Indies looking to complete the hattrick of World Cups, but like in earlier one, the West Indies juggernaut was halted by determined and dogged Indians led by mercurial Kapil Dev. Many considered India’s victory in the 1983 World Cup as a fluke, but victory in final against the arch rival Pakistan cemented India as the force to reckon with. It was the second World Cup in India and Bangalore witnessed the pulsating quarter final between India and Pakistan which India went on to win with young Ajay Jadeja demolishing Waqar Younis still fresh in every Indian’s mind. It was Tendulkar against the Australian team. The master blaster single handedly led India to one of its most memorable victories. Australia won the opening test match in Mumbai and was on its way in Kolkata as well. But what we saw after India was forced to follow on was an absolute master class from VVS Laxman and Rahul Dravid. Their heroics not only bailed India out of the trouble and made likes of McGrath, Warne and Gillespie look ordinary but along with Harbhajan Singh made sure India won the test and level the series 1-1, which India ultimately won. Chasing 325 runs to win, India was struggling at 146/5 with all the big guns back in the pavilion and not much could be expected from new comers like Yuvraj Singh and Mohammed Kaif. But what transpired after that is considered on the greatest one day comebacks of the modern times. Yuvraj and Kaif (not out till the end) along with the tail enders’ took India to a famous victory. Some consider this innings by Rahul Dravid which gave him the nickname “The Wall”. He single handedly took on the Australian attack and scored a wonderful double hundred in the first innings and a gritty 70 odd not out in the second innings that took India to victory and also not to forget the spell Ajit Agarkar bowled to skittle Australia out for less than 200 in second innings. Mahendra Singh Dhoni led a very young and inexperienced Indian team to its maiden T20 World Cup that helped lift the gloom over the Indian cricket which had surrounded after a dismal 2007 50 over World Cup. 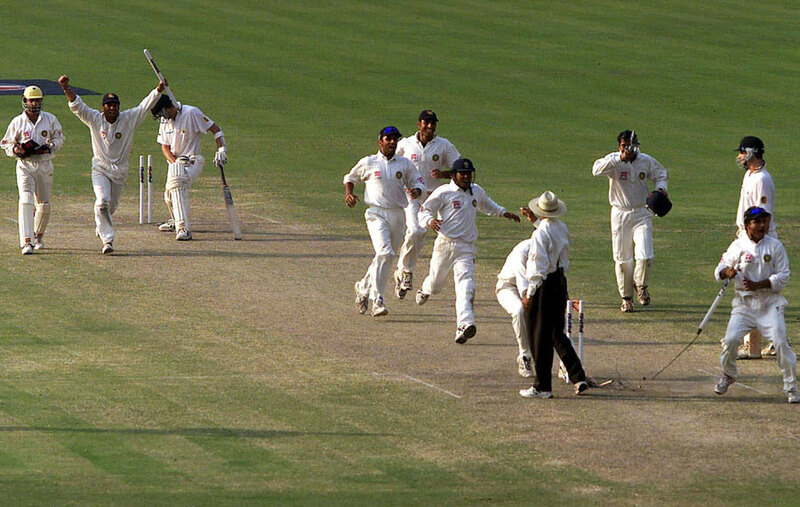 India registered arguably one of its most famous overseas test victories when they defeated Australia in Perth (considered to be the fastest pitch in the world) and gave the Aussies a test of their own medicine. Sachin Tendulkar after all those years of sacrifice and sheer determination led India to their second ICC 50 over World Cup, thus giving billions of Indians a reason to smile and to be proud of.